The Rosy Boa (Lichanura trivirgata) has recently become one of the more popular reptiles to own and keep in captivity and make an ideal reptile "pet". The reasons for the Rosy Boa’s popularity are numerous and well merited. They are docile, slow moving snakes which seldom bite, are represented by a wide spectrum of interesting colors and stripe patterns, and are generally easy to maintain and propagate. Rosy boas are only found in the extreme southwest United States, Baja California and the Sonoran Desert of Mexico. Adult rosy boas are usually between 2-3 feet in length, rarely exceeding 3.5 ft.. They have thick bodies with small heads. Young rosy boas are 12"-24" depending on age. Rosy boas have been found in a wide range of interesting colored stripes, from orange to red, copper, rust, brown or black. The color and eveness of the stripe is linked to the geographic origin, or locality, of the specific Rosy Boa. 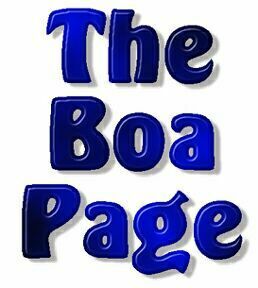 As a general rule, boas from lower elevations have lighter colored stripes, but this is not always the case. The interspace colors vary in shades of gray. In captivity, rosy boas almost exclusively eat mice, either live or thoroughly thawed frozen mice. Most rosy boas are enthusiastic eaters. One mouse per week is usually sufficient. The most important principles in maintaining healthy rosy boas is access to a proper thermal gradient and low enclosure humidity. Thermoregulation is necessary for proper digestion and gestation. Rosy boas are primarily nocturnal or crepuscular, inhabiting hot, arid environments with high sun exposure. Many different types of enclosures will work, e.g. glass aquariums or plastic sweater boxes, with proper thermal gradient and excellent ventilation most critical: cool side 78o-80oF<--->87o-90oF warm side. Thanks to Duke Owens for the care sheet.